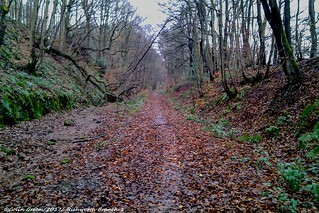 Colin Green Photography: The Remains of the Rishworth Branch Line. 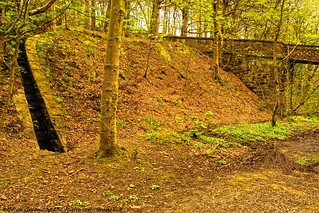 The Remains of the Rishworth Branch Line. 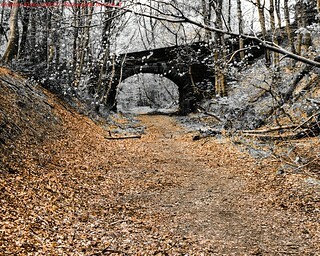 These are a collection of photographs taken in a number of spells along what remains of the Rishworth Branch Line. There are 2 albums to view on Flickr and Clickasnap each containing a different set of pictures. The Rishworth Branch Line was a railway that ran from Sowerby Bridge to Rishworth through the Ryburn Valley for a length of approx. 4 miles. There was an original plan to extend the line through to Littleborough under Rishworth Moor but despite surveys being completed this was never undertaken. It was built to double track standard with this in mind but the 2nd track was mainly used to store carriages and engines. The line features stations at Sowerby Bridge, Triangle, Ripponden with Barkisland, Rishworth and from 1907 a halt at Watson's Mill Crossing. Completed in 1878 passengers were only carried until 1929 when due to the rise in trams and buses this became unviable. Freight ceased to be carried from Rishworth in 1952 and the whole line closed in 1958 with the tracks lifted shortly after. There is surprisingly a lot of the bridges still present with only Ripponden Bank bridge, a footbridge near Kebroyd and the trestle bridge at Rishworth long since removed. There are still platform remains at Rishworth and the Scar Head Tunnel (542 metres) are still to be found along the line, although neither are easily accessible. In all the line featured 14 crossing, a tunnel, 2 underpasses, and 5 stations. Whilst some parts belong to private owners and are not accessible large parts of the former track bed are a public bridleway / footpath and make for a pleasant woodland walk. The albums on both Clickasnap (Rishworth Branch) and Flickr (Rishworth Branch) are currently being added to so not all pictures can be viewed yet so please keep checking. I've hundreds that have taken along the former line so will be adding regularly over the next few weeks. Sadly I am unable to embed pictures from my Clickasnap album but they can be viewed by clicking this link which opens in another window. Clickasnap Rishworth Branch Line album. Please take a moment to view the pictures on Clickasnap as they pay a small contributors fee to photographers that display there pictures to support there photography. You can also buy copies of my pictures and other photographers on Clickasnap. All the pictures remain the copyright of Colin Green and may not be reproduced, copied, edited, published, transmitted, or uploaded in any way without my written permission. Copyright © 2017 Colin Green All Rights Reserved. You can follow me on Facebook, Twitter, Tumblr, Pinterest.and Clickasnap. Please take a moment to view my pictures on clickasnap as the photographer receives a small payment from them for any photos viewed over 10 seconds. You can now also purchase wall art, gifts, digital downloads and prints of my pictures listed on the clickasnap marketplace.